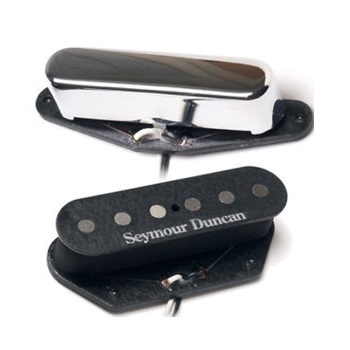 Extremely balanced true single-coil pickup developed for Nashville studio players. Recommended for traditional country, country pop, blues, and classic rock. Tele® players often complain that their low strings sound "mushy" and their high strings are too bright - especially in the bridge position. The Five-Two concept corrects this with Alnico 5 magnets on the three low strings and Alnico 2 magnets on the three high strings. The result is an all-around, extremely well-balanced pickup with traditional output and vintage appointments such as vulcanized fibre bobbins, formvar wire, vintage magnet stagger and waxed cloth hookup cable. Rhythm model comes with chrome plated brass cover. Available for both rhythm and lead positions. Rhythm is RW/RP for hum canceling when using both pickups together. For all well-balanced instruments. Works equally well with maple and rosewood fingerboards.